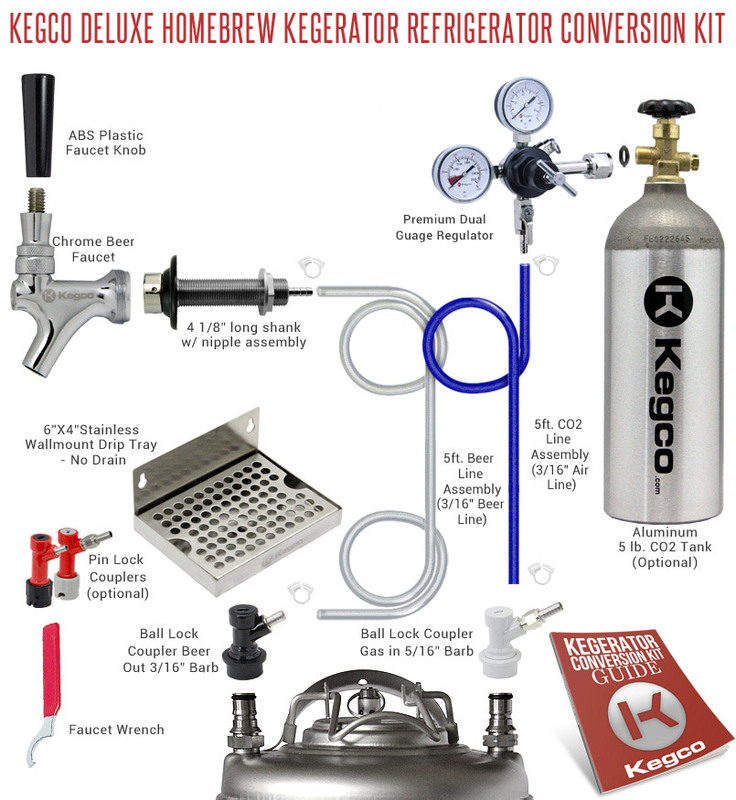 When you convert a refrigerator or freezer using Kegco's Deluxe Homebrew Kegerator Conversion Kit, you'll have everything you need to quickly and easily begin dispensing delicious home brew beer - you just provide the refrigerator and the keg! Drawing from years of beer dispensing experience, Kegco has designed conversion kits that use only the highest quality commercial grade parts, from the user-friendly commercial grade double gauge regulator to the convenient stainless steel drip tray. Depending on your needs, you can purchase this kit with ball lock couplers for use with Cornelius Pepsi kegs, or with pin lock couplers for use with Coke kegs. Every kit comes with detailed instructions to guide you every step of the way, and our knowledgeable product specialists are available at 1-800-710-9939 for additional support. Our 6" x 4" door mount drip tray's clean design, durable stainless steel construction, and attractive brushed finish have made it a favorite of beer lovers. Hassle-free from start to finish, this drip tray can be quickly and easily mounted using the two screw holes in the backsplash, and when you're done dispensing for the day, a removable grill makes clean-up a breeze. This drip tray does not have a drain, so it will need to be emptied manually. You can upgrade to a drip tray with drain for $4. Durably constructed to deliver a consistent flow pour after pour, this commercial grade double gauge regulator features a T-style adjustment valve that makes it easy to adjust the pressure inside of the keg. The gauge on top of the regulator indicates CO2 pressure in the keg, while the gauge on the side indicates the remaining volume of CO2 gas. A pressure release valve is conveniently located on the body.